An alleged drunk driving accident in Massachusetts injured a state trooper on Interstate 93 in Randolph in a construction area in the early morning hours, according to the Boston Herald. The driver is now facing her second operating under the influence (OUI) charge in Quincy District Court after rear-ending the state trooper. She blew a .15 on a Breathalyzer test. authorities report. Our Boston drunk driving accident lawyers would like residents to understand the dangers and consequences of driving while under the influence. Alcohol-related accidents oftentimes lead to serious injury and an experienced attorney should to be contacted immediately if you’ve experienced an accident with one of these irresponsible drivers. The alleged drunk driver is also facing charges of failure to yield to an emergency vehicle and negligent operation for allegedly hitting the trooper, according to state police. The officer remains in Boston Medical Center with serious injuries. According to state police spokesman David Procopio, the early morning accident happened about 1,000 feet from the ramp to Route 24 southbound. At the time of the accident, the far left lane was closed to traffic because of construction work. The lane closure was distinctively marked with signs and arrows and the police cruiser. The cruiser’s emergency lights were activated during the time of the accident. In the last year a dozen troopers have been injured by vehicles while either working paid details or investigating crashes, according to State Police spokesman David Procopio estimated. 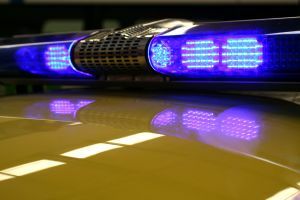 Police statewide, are actively increasing their patrol units as an initiative they’ve called Operation Lightning, according to the Executive Office of Public Safety. This operation is deploying additional patrols every Friday and Saturday night to target drunk drivers. In the last two weekends alone, the Operation arrested 24 drunk drivers and made an additional 14 arrests on various other charges. Criminal summonses were distributed to 15 other drivers and 263 citations motor vehicle violations were issued by the extra patrols. Operation Lightning expects to run through the rest of the summer. This year alone, preliminary statistics conclude that there have been nearly 150 fatalities on Massachusetts roadways. Nationwide, about one-third are caused by drunk drivers. While the statistics aren’t showing a steep increase, local officials are not satisfied. Any number of injury or loss of life on our roads that is caused by impairment, aggression, speeding, negligence or distraction is unacceptable. Roughly half of the 87 police officers that have been killed in the line of duty across the country so far this year were killed by motor vehicles or in car accidents. The Massachusetts State Police have had 10 cruisers struck by drunk drivers so far this year alone. The current number puts the state on the same pace in reaching last year’s total of 20 cruisers struck by impaired drivers.